Katherine with a K: What a difference 400km makes! What a difference 400km makes! Well. I’ve completed my first two weeks of Swiss life. And I have to say, I’m stunned. Stunned as in the difference it is from where I just moved from. I moved 400km due south to Lugano, Switzerland and I can’t believe the difference in culture. Sure, every city, heck, even every country has it’s own intricacies, but the difference is amazing. The biggest thing I noticed off the bat, is that people make eye contact and greet you. Something I really took for granted before moving to the depths of Franconia Germany! To be fair, a lot of Germans find Franconians to be chilly (a mass generalizing I know, but one I found to be reasonably accurate) In my old building, if I made eye contact with someone and greeted them, 90% of the time my greeting was met with a bowed head and a quick scurrying away like a mouse. Once in a while I got a grunt. 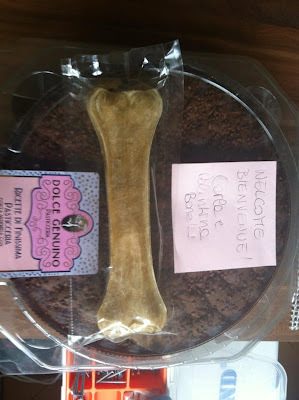 Today, one of my neighbors left me out a chocolate cake and Lucy a rawhide bone. It almost brought a tear to my eye: my old neighbors used to gripe about Lucy peeing on the patch of grass (despite the 6 cats that roamed free) and one even insinuated I had something to do with the theft of his bike! I thought communicating would be a challenge since I live in the only area of Switzerland where Italian is the most widely spoken language. One of the good things about living in Switzerland is that there are 3 official languages, so most people speak on or more of German, French and Switzerland. Though my French is rusty, most of my schooling was in French so getting by is a breeze. The biggest amazement though is the fact that I live in a place I (and most of the rest of the world) would happily vacation. I’m stunned by the beauty of where I live. My apartment is 200 meters from the lake which is surrounded by small mountains or large hills depending on your perspective. The architecture and feel are Italian. Whenever I discover something new, I’m amazed that I get to live here. Of course, nowhere is perfect and here, nothing is still open on Sundays and before I griped about grocery stores closing at 8pm, here they close at 6:30 pm making grocery shopping a logistical challenge. Also, the cost of some things is beyond ridiculous. I saw a houseplant at my local grocery store that would be $20 in Canada or 20 euro in Germany for 50CHF! (the equivalent of about $50us) Since I pride myself on being resourceful, I have found a work around though. Not only will I stock up on visits back to Germany (also a good excuse to see the friends I’ve made) but Italy is but a 20 minute drive away. And, in Italy, I’ve happily discovered, things are not only cheaper but they’re open until 10pm and on Sundays and holidays. Pretty much nirvana! I’m sure it won’t be perfect and I’ve heard people complain about the sleepiness of Lugano. It’s no rocking metropolis, that’s for sure. It has a population of only 75,000: though you’d never guess it by the amount of traffic in town (because of it’s proximity to Italy, 50,000 Italian travel daily to work in Ticino (the canton where Lugano is located) ) I don’t know that I’ll miss a “big city” life since Milan is a quick hour drive away it’s easy to just drive or hop on a train to go shopping or catch a concert. Where I am at my life right now, I’m happy for a bit of quiet and beautiful surroundings. In the past two weeks, I’ve really pondered my German experience and though it can be summed up as nothing short of challenging, I’m happy I experienced it. Had I moved straight from Vancouver to Lugano, it would have been too easy- I’d have been spoiled. Though painful, I’m glad I had my German interlude to give me perspective. Of course, I could have down without the lawsuits and grumpy neighbors, but that’s just part of life I guess. Great to hear/read this! Nw it's time to change the tag line on your blog...'transplanted to nirvana'? !